This mummified corpse of a frog was found in a hollow flint ‘geode’ which was cracked open in 1899 by workmen in a quarry in England. There have been many reports of frogs found inside rocks; some still living in a kind of stupor but which revived once exposed to the air. In 1910 a living toad was found when a piece of coal was broken open; another was found in 1906 six feet underground found seem to be stuck in limestone. The theory is that a small tadpole somehow enters a crack in a forming nodule or pocket and gets trapped in there as it grows. As it does, the smell attracts tiny insects which feed the toad and keep it alive. Through this crack also comes water and air. This is fine for some of the many examples that have been found but makes no sense in cases where live frogs have been found in totally sealed or deeply buried pockets. 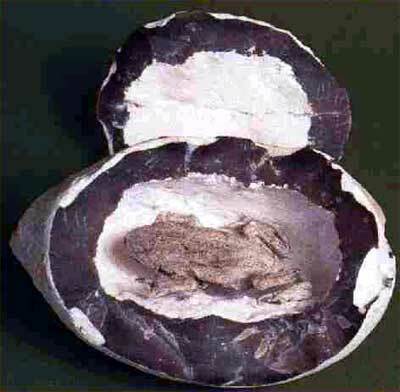 Some frogs have been found with the impression of their bodies so tightly jammed against the rock ‘pocket’ that even the skin’s crackles can be seen imprinted on the sides of their frog-shaped hole –meaning the rock formed around them somehow.